Sorry Folks, Streaming videos went down with the dismantling of the Supersphere server. Most Quicktime links are still valid. 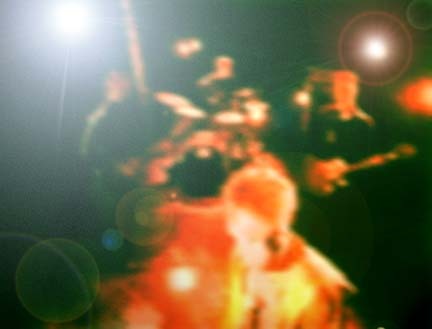 "Stuck / When A Man Says Ow"
This is a 16 MB Quicktime video!!! 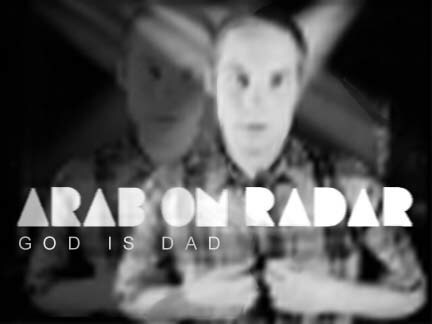 ARAB ON RADAR "God Is Dad"
from the album "Yahweh or The Highway"
Featuring Bill Pisarri (Flying Luttenbachers Revenge Trio) as Wigface! The DRUM BUDDY SHOW preview! 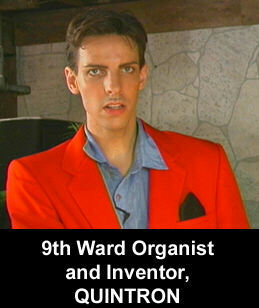 Quintron, the eccentric organist and inventor from New Orleans, introduces you to his latest patented invention, The Drum Buddy! This amazing new instrument is a five-oscillator, light-activated, mechanically-rotating drum machine that took five years to develop and design. 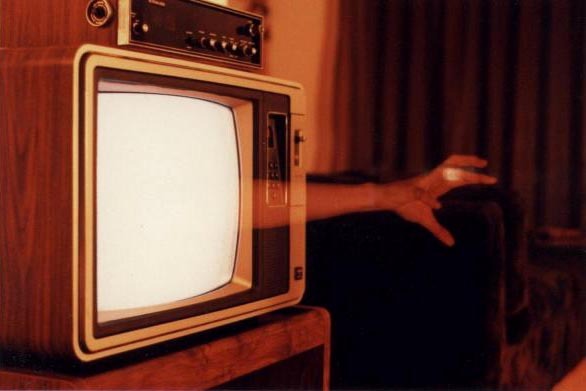 The multitude of sounds it produces are a result of a direct link between the human hand and sheer electronic voltage! 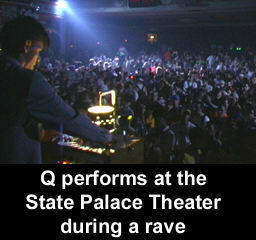 Taped live in front of a studio audience at the Spellcaster Lodge in the 9th Ward, this entertaining infomercial takes you from the classroom of a local high school to the stage of a late-night rave. This classic TV infomercial includes performances by Quintron, Miss Pussycat and her puppets, MC Trachiotomy, the Drum Buddy Dancers, and legendary R&B recording artist Ernie K-Doe. Hosted by Bob Global and Rebecca Simms for Midwest International Industries. Directed by Rick Delaup. 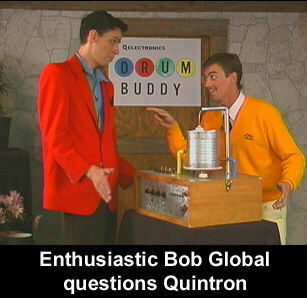 The Q ELECTRONICS Drum Buddy Demonstration LP/CD is available for purchase at the catalog page. 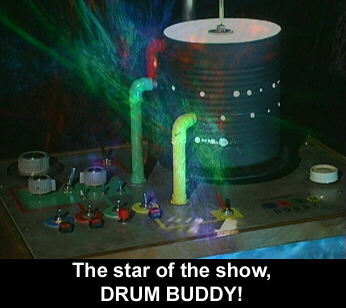 You can order your Drum Buddy now for a special introductory low price of $999.99. Only 100 Drum Buddies will be sold! Each drum buddy is handmade and tested by Quintron. Each Drum Buddy is an original, each sounding slightly different. The Drum Buddy comes with a 9 year guarantee. Also included is a FREE CD or LP of the Drum Buddy Demo, and a Drum Buddy hot beverage ceramic mug! 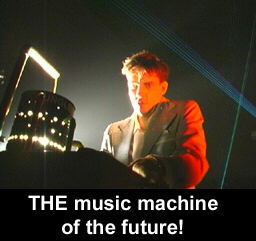 PLUS, you get FREE admission to a Drum Buddy workshop where you get a hands-on lesson from the inventor and master of the instrument himself, Mr. Quintron! 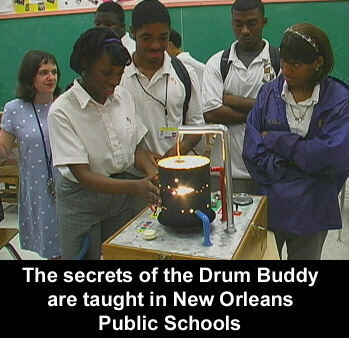 * * All Drum Buddy workshops are held in New Orleans. If you live outside of the city, you must pay all of your own expenses to New Orleans for the class. For expanded cover age of the Drum Buddy infommercial, behind the scenes photos, and a complete report on the world premiere & party at the Shim Sham club (Featuring Quintron, Miss Pussycat, MC Trachiotomy, Ernie K-Doe and a host of guests) GO TO: www.eccentricneworleans.com and check out Quintron's personal band page at our site for even more info! SPACE STREAKINGS "Special Karoke King" + BONUS! Tokyo's hyperactive rascals deliver the goods with this video from the "7-Toku" LP, plus the "Super-Mini-Car" short! See The SUPER BEEPER!!! Directed by Usama Alshaibi. An excerpt from our failed network pilot! Not even Mclean Stevenson could have saved this show! Lots of surprises here! WARNING: This one is a 13 mb Quicktime video - will take a while to download no matter how ya slice it. 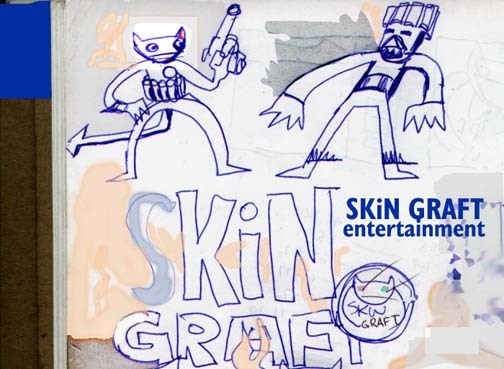 So start downloading, make yourself a sandwich and get that laundry going in the meantime.